While most of us are probably aware of the powerful benefits of regular exercise, we're clearly not all convinced: Just about 20 percent of American adults over the age of 18 meet the government's recommended guidelines when it comes to physical activity, according to a CDC report. The average adult needs at least two hours and 30 minutes of activity each week, if it's at a moderate intensity level, like brisk walking. Up the intensity to jogging or running, and you can aim for at least 75 minutes a week. Add in a couple of strengthening sessions a week, and you can expect to build muscle, protect your heart, avoid obesity and even live longer. That's not to say that shorter bouts of exercise aren't worth it. Even just in 10-minute increments, exercise can make a marked difference in health and well-being. But those of us who make exercise part of their regular routine -- without overdoing it -- are certainly reaping the biggest benefits. Don't believe us? Consider a few profound factoids: Regular exercisers have a 40 percent lower risk of developing dementia, and a 60 percent lower risk of any type of cognitive impairment, according to a 2012 study. In young adults, regular exercise can increase bone mineral density by as much as 2 to 8 percent a year, according to the New York Times, helping to prevent dangerous falls and fractures later in life. Some of the big differences between sedentary and active people are obviously beneficial, like a longer lifespan or a less-taxed heart. Others are a little less clear, like a higher maximal oxygen uptake, or VOmax, which reflects a regular exerciser's increased capacity for aerobic exercise, or a more efficient sweating response, which helps regular exercisers cool their bodies quickly. 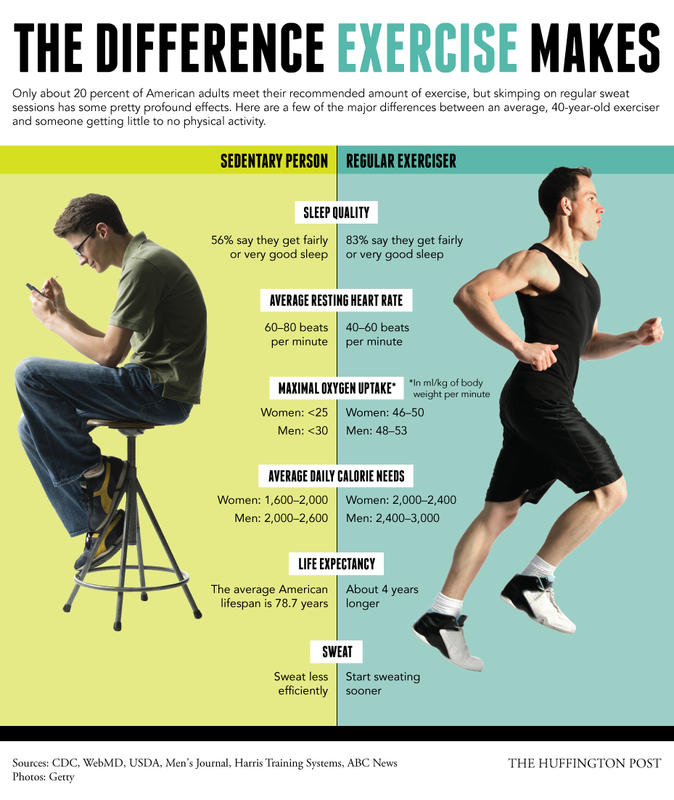 Check out these and other differences exercise makes. Then go ahead and lace up those sneaks.